CENTRAL TRADE UNIONS AND INDEPENDENT FEDERATIONS HAVE DECIDED TO GO AHEAD WITH MAHA DHARNA AFTER TALKS WITH LABOUR MINISTER. 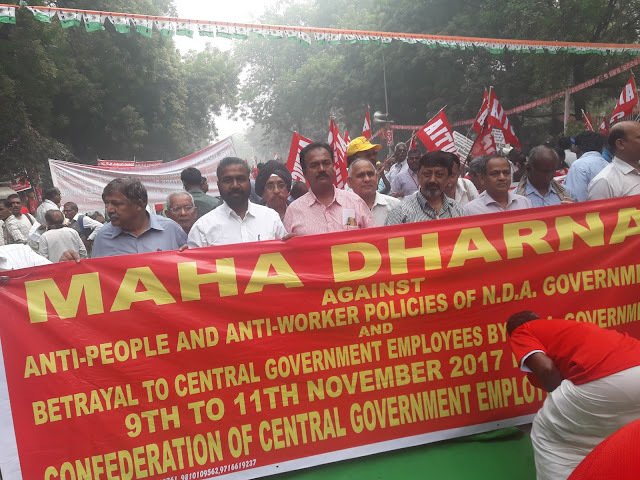 The Joint Platform of Central Trade Unions, comprising Central Trade Union Organisations and all major industry/establishment wise federations have decided to stage three days’ mass dharna before Parliament against the anti-worker, anti-people and anti-national policies of the Central Govt on 9-11 November 2017. 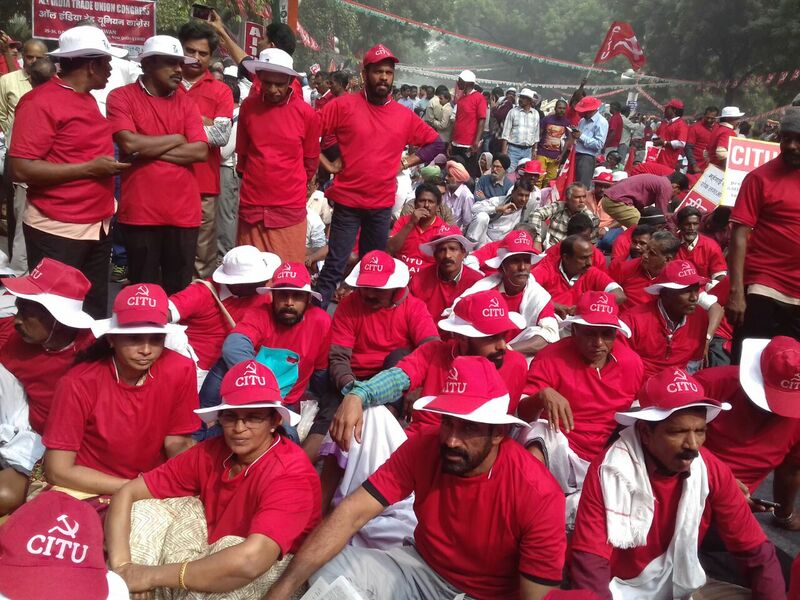 The Joint Trade Union Platform represents workers and employees from all major sectors of industries and services viz., coal, steel, transport, telecom, petroleum, electricity, port & docks, engineering, construction, scheme-workers etc and employees of Central Govt and state govt, Railways, banks, insurance, defence production, etc. 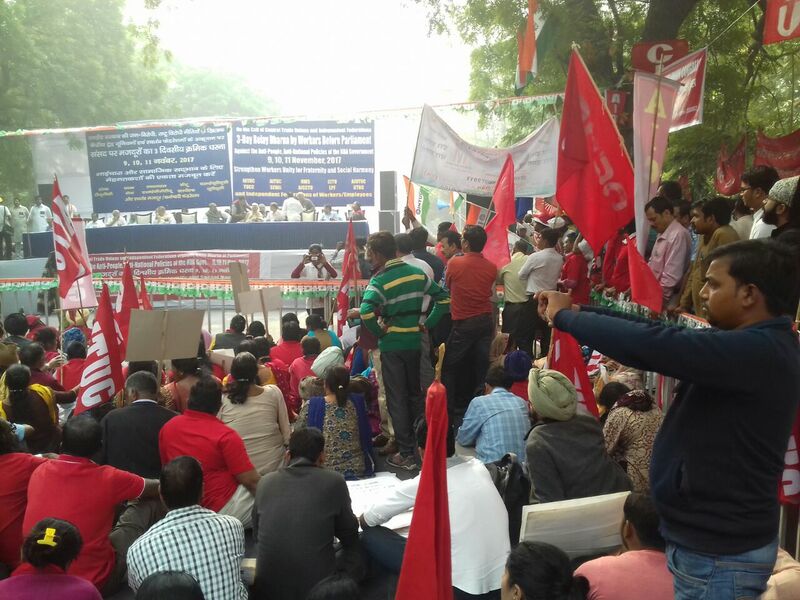 This ‘mahapadav’ is intended to demand the government to concede the unanimous demands which the joint trade union movement has been raising since the last over eight years. 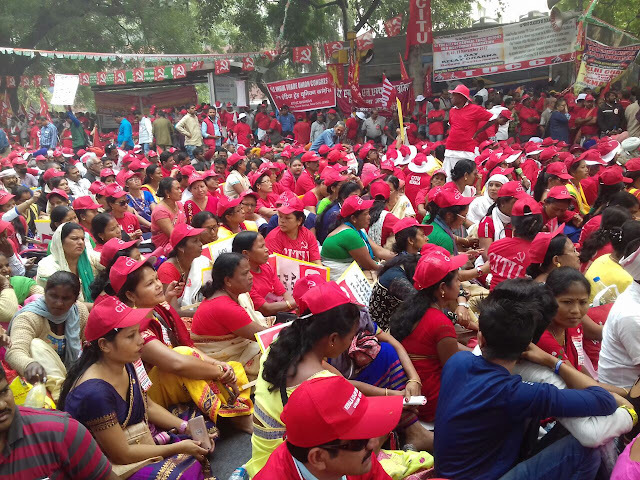 It is a step towards preparation for the next higher phase of united struggles including indefinite countrywide strike action, if the government continues to ignore the demands of the workers and proceed with its pro corporate agenda. The anti-people and anti worker policies of Govt at the centre are inflicting horrific miseries and hardships on the crores of common people from every walk of life. Unemployment is getting aggravated with every passing day, calling the bluff on the Modi Govt’s promise of generating additional two crore employment every year. In fact employment generation has already turned negative following the increasing phenomenon of closure and shut-down of industries. Demonetisation, under the utterly false pretext of curbing black money, had further depressed wages and perpetuated closure of industries. 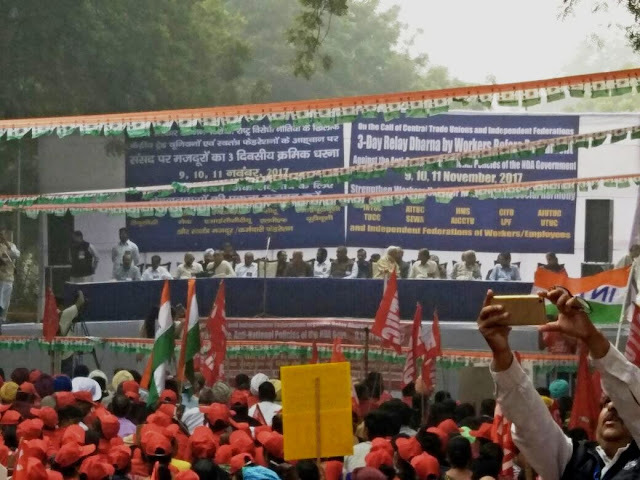 It has shattered the entire economy, particularly the unorganised sector, the SME sector and the small traders and peasants in turn adversely impacting the lives, wages and earnings of crores of toiling people. Even after one year, the economy is yet to recover from its damaging impact. Hasty implementation of GST had further aggravated the miseries of people through fuelling price rise and jeopardising services, trade and various occupations. Despite the sharp fall in international price of crude oil, the government refuses to pass on the relief to the common people; instead, the prices of petrol, diesel and cooking gas are continuously increased resulting in cascading effect on the prices of all essential commodities. 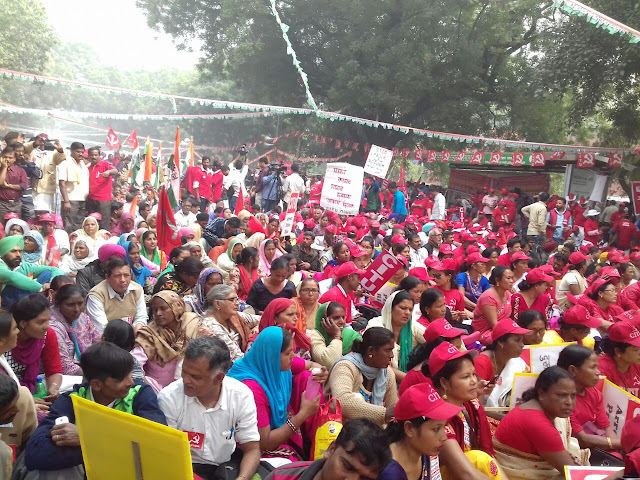 The Govt has been arrogantly ignoring the 12 point charter of demands including minimum wage, social security and workers’ status and accompanying benefits for the scheme workers; it is going ahead with privatisation and mass scale contractorisation. 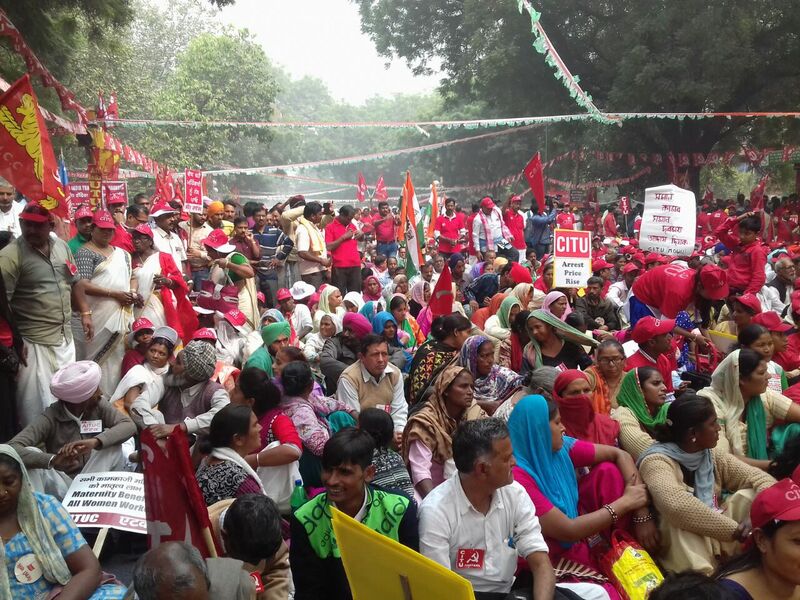 The constitutional and statutory provisions for ensuring ‘same wages and benefits for same work’ are being denied to contract workers despite Supreme Court’s categorical judgment. 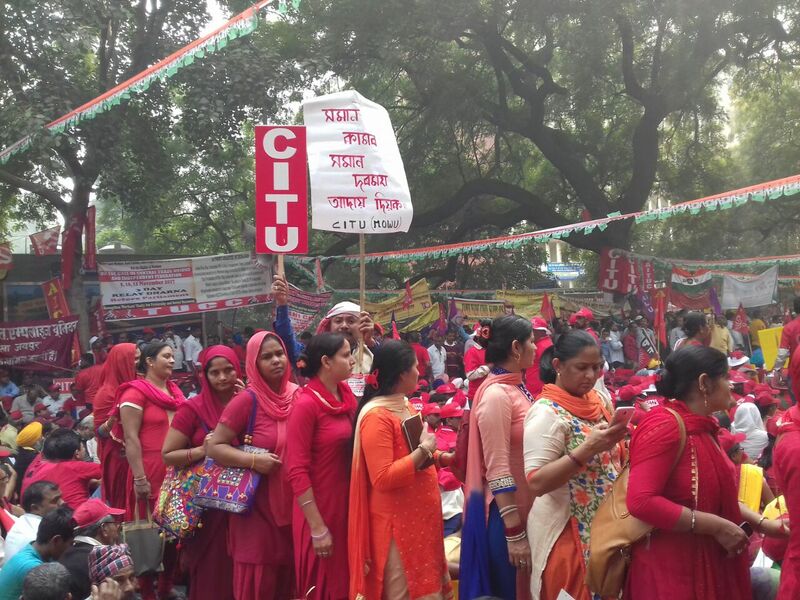 The Govt has recklessly embarked upon privatisation of all public utility services like health, education, transport, Indian Railways, financial services electricity, water etc through multiple routes including whole sale outsourcing. It has allowed 100% FDI in almost all sensitive sectors including defence production, railways, oil, minerals, port and dock etc. It is destroying indigenous production capabilities to serve the interests of MNCs, under the dubious veil of “Make in India” slogan. The national interests are being severely compromised through such disastrous moves. In addition, in order to promote “ease of doing business”, the Govt has embarked on arrogant pro-employer amendments of all labour laws aimed at imposing conditions of slavery on the working people. Already, the text of the Code on Wages Bill, Code on Industrial Relations Bill, Code on Social Security Bill, Factory (Amendment) Bill etc are in public domain. 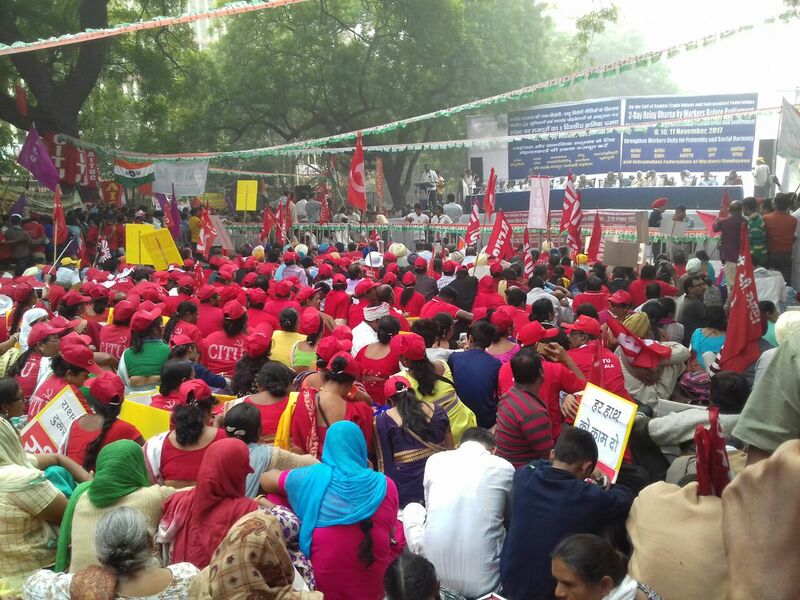 All these are designed to push the overwhelming majority of workers and employees out of the regulatory purview of most of the labour laws, curb workers’ right to form unions and protest/agitate including right to strike, and dismantle whatever existing meagre social security provisions. Simultaneously, the communal forces, with the open and active patronage of the Govt and ruling polity are carrying out a dubious divisive and disruptive campaign to spread hatred among people, killing innocent people, particularly from the most downtrodden sections. The country is witnessing the conspiracy to create unprecedented disruption in the unity of the toiling people of the country. Trade unions are fighting against such disastrous designs of spreading poison of disruption in the society. The Govt’s response to the 12 point charter of demands, in the meeting with all central Trade Unions called by the Labour Ministry on 7th November 2017, remains virtually negative on all counts reflecting their bias against the interests of the mass of the working people. 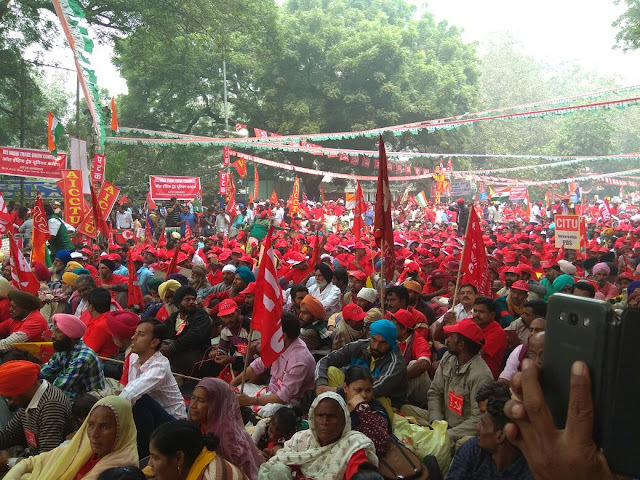 In totality, the policies of the Govt are destructive towards the interests of the workers, farmers and the common people at large and also against the national interest. 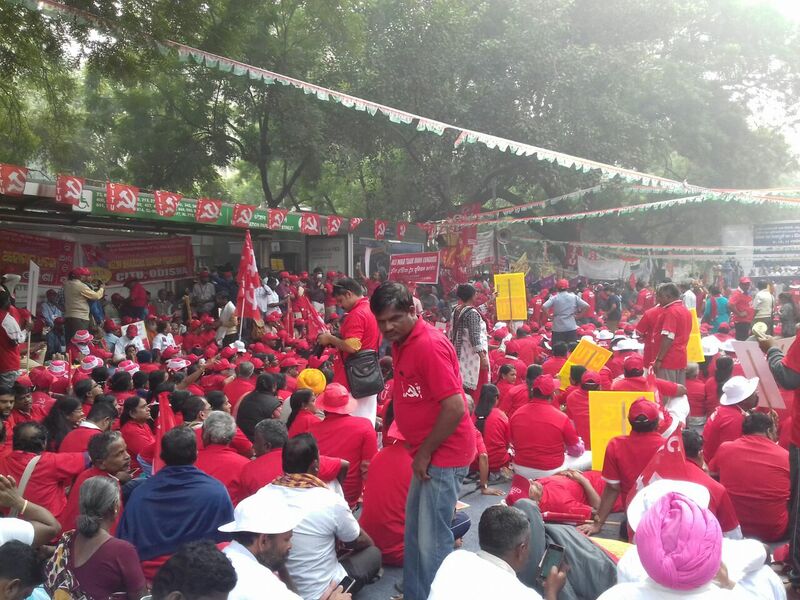 Representing the workers who generate the GDP and the wealth for the country, the true patriotic people concerned about welfare of all sections of toiling people, the Joint platform of united trade union movement is in a struggle to save the people and the country and force a reversal of the anti-people and anti-national policy regime. 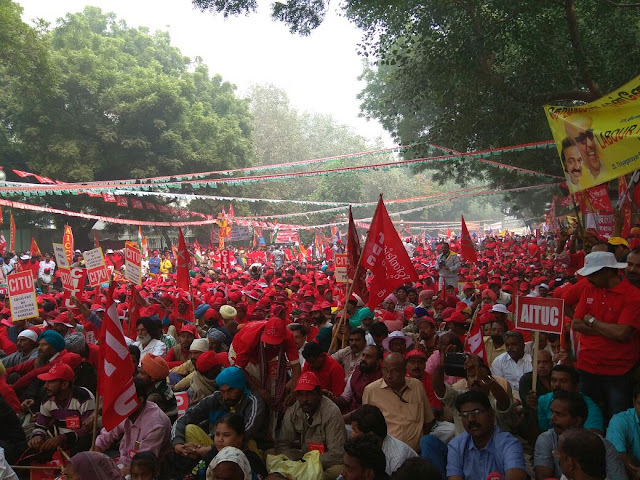 This determination is getting reflected in numerous struggles, agitations and strikes in various sectors of the economy, both organised and unorganised, during the intervening period. 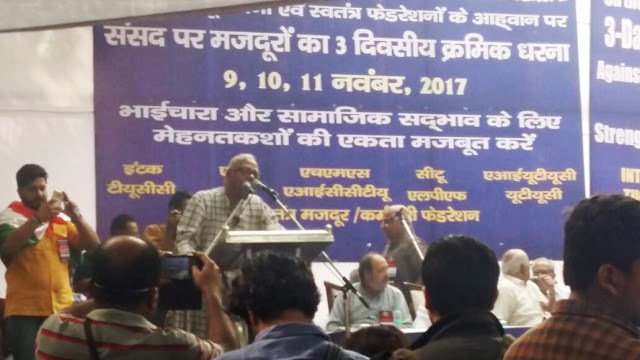 Lakhs of workers from all over the country and across the sectors are going to converge in the massive three days dharna before the Parliament on 9-11 November 2017 to pave the way for further heightened resistance struggle in the days to come to reverse and defeat the anti-people and anti-national policy regime in order to save the country and the people.